Fans of the Ghosts 'n Goblins series should be familiar with the rather annoying little demon Firebrand; he would be the main reason Arthur would spend his time walking around the many levels of the games in his underwear. Capcom obviously thought enough of the guy to give him a series of his own, which began life on the Game Boy systems. Not content with these titles, Capcom decided to give the little guy his own Super Nintendo action release and the made it every bit as difficult as the Ghosts 'n Goblins titles as well. Okay, maybe not quite that tough, but you get the general idea. And while this game never made it to last gen's Wii Virtual Console, it's pleasing to see Capcom take the time to bring it to the Wii U eShop's VC — bonus points for re-releasing this in time for Halloween, too. To help make things a little easier, the control system used in Demon's Crest is lightyears ahead of the Ghosts & Goblins series. Not only do you have full mid-air control of Firebrand in this one, but you also have a wide range of attacks and special moves. You can jump and hover in mid-air, which makes avoiding some of the nasty obstacles in the game a tad easier. You also have the ability to grab onto walls, as well as thrust your shoulder into objects to break them open. But as helpful as all of these moves are, it's your ability to breath fire that will prove the most invaluable tool of all. 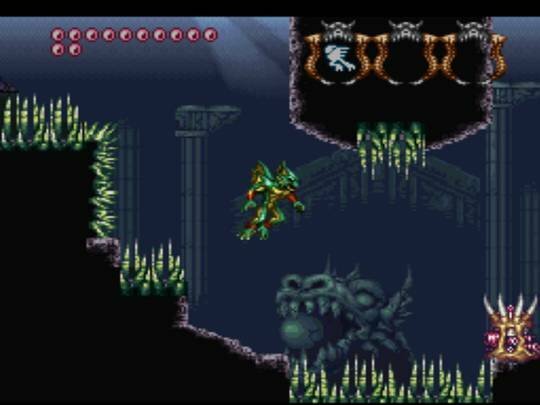 As if your wealth of gameplay moves isn't enough, you will also acquire items throughout your quest called Transformation Crests that will allow you to change into a much more powerful demon with special abilities, ranging from swimming, cutting vines, jumping higher, and reducing the amount of damage you take from enemies. You can even purchase items such as potions that allow you to use magical spells that will definitely come in handy on some of the tougher levels and later bosses. It is worth mentioning that this game is not for the less-seasoned gamer and should be approached with caution for those that tend to find themselves easily frustrated. This is a game that's going to take a lot of playing in order to beat, so prepare yourself accordingly. But other than the stiff degree of difficulty, this is a terrific game with a surprising amount of depth for a side scroller. 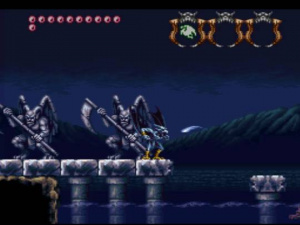 Fans of the Ghouls & Ghosts series are going to feel right at home in the nicely constructed worlds of Demon's Crest. Each area has a very spooky and distinctive look to it, complete with the high level of detail we've come to expect from Capcom. You'll see everything from graveyards and towers to the underwater city of Atlantis. Since this was one of the Super Nintendo's later games, you can rest assured that the visuals are some of the best the Super NES has to offer and the sheer level of detail, even in the distant backgrounds, is astonishing. You'll even see some nice drop-shadow effects when you're near the flames on the torches. The bosses in the game are huge, but the animation on some of the larger ones isn't quite as fluid as you might, but given the size and detail of these bosses, it's difficult to complain. 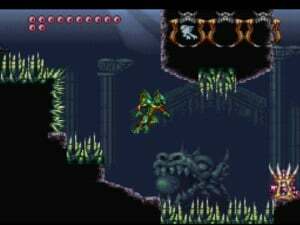 If you've played any of the Ghouls & Ghosts games, you're going to have a pretty good idea of what the music in Demon's Crest is like. It features a spooky, pipe-organ style theme in most tracks that sets the mood perfectly for the game. It's also quite nice that most of the tunes are fairly long as to avoid the constant repeating of the same melodies over and over again. The game also sports some downright scary sound effects that do a really good job of showing off the Super Nintendo's sound capabilities. To top it all off, it's quite nice to be able play this on the Wii U GamePad, as is always the case with Wii U Virtual Console games. Also, the faint of heart can make use of the in-built save state functionality on some of the tougher sections of the game... but we don't condone that of course! It's hard not to find anything not to like about Demon's Crest, despite its difficulty. The ability to play the levels in different orders, not to mention the free-roaming feel of the game make it seem like an RPG at times. The fact that it's also chock-full of gameplay elements just further makes the title endearing and enjoyable. It's fairly safe to say that if you loved the Ghosts 'n Goblins franchise, you're going to love this spin-off, and even if you're not a big fan, you may find that the added playability of Demon's Crest might be enough to make a fan out of you. I am tempted to play this though. I've been thinking of getting this game since I never played it on the SNES. Downloaded this as quickly as I could along with Gargoyles Quest 2! Happy Halloween! "It's hard not to find anything not to like about Demon's Crest, despite its difficulty." Can we try that again without the double negative? I never knew there was was a SNES version of Gargoyles Quest (GB), loved that game - I got it on VC for my 3DS. Definitely one of my favorite SNES games. It's difficult, but fair and hardly ever frustrating. I LOVE that you have infinite lives and wish more old school platformers had that feature. Thanks for the review, and I hope more people are convinced to give it a shot. The physical cart for this game is quite pricey. This is a nice alternative for those that would like to check it out. I'm definitely going to purchase this one soon. OH HEY @Corbs!!! Good to see a review from you again. And life is once again complete. Definitely one of the best of Capcom's Super NES classic. So glad it finally made it to Wii U VC. We need SNES VC on 3DS now!! I have never played any of these spin offs, is this a good place to start? Long answer: All the games are different enough, but IMO, this one is the most fun to play, with the most depth and playability. I'd more than recommend starting with this one. "It's hard not to find anything not to like about Demon's Crest"
.....I can't figure out what the heck this means. Anyway, this is one of my favorite SNES game ever made and yes, I have a complete copy of this game. Bought it before the price skyrocketed! @Ryno Ah, I see. Wasn't aware they re-used old reviews for the VC versions. This is tied with Super Metroid as my favorite SNES game. If you are a fan of the mega man X games you should also love this game. If you like shovel knight you should love this game. If you have a passing interest in video games you should love this game enough to learn how to be good at video games. I don't know if it was because of the themes but this game had negative sales when it first released for a while even though every review gave it high praise. I don't mean a "Journey" indie darling high praisd either. A "this game is everything great about video games and if you don't like it what the hell is wrong with you" kind of praise. Take everything great from Capcom SNES games, throw in the ability to become almost as powerful as the devil but still not make the game easy awesome experience and this is it. This is without a doubt the most neglected major release of this quality of the 16 bit era, maybe any era. Thanks for the short and the long answer. Forgot to say I have the cart, got it when it was not long after release for cheap since it wasn't selliing well. I don't think I have the booklet anymore though. I wish they would start doing the orignal manuals for all VC releases. Off topic but what is with all the spam accounts lately? This is one site I haven't really noticed them on before but lately when I check back on a topic half the time I have to report one. @Ryno Disappoint. Oh well, it was good back then, still good now...minus some typos. Just purchased the trilogy on Virtual Console. Starting Gargoyle's Quest as we speak and will move on to Gargoyle's Quest II and then Demon's Crest. @SetupDisk It seemed to start after that SSB demo give away.With all those email addresses given out it must have been spammers heaven. Fantastic game but man it's tough. I found out that Super Ghouls and Ghosts has a GBA remake. Hopefully we get that next. 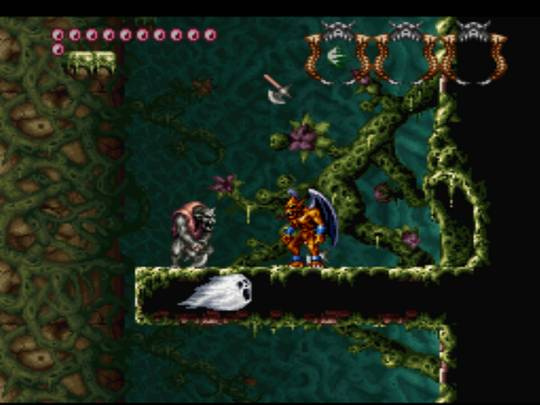 BTW, Ultimate Ghouls & Ghosts on the PSP seems pretty similar to Demon's Crest from what I've played. Just thought I'd throw that out there. I can fairly well agree with that number score, but I will add that it's not openly for everyone. I had that game for about two years and could never play more than an hour at any time as I'd just get tired of playing it. It was fantastic I think, at least mechanically speaking, especially the visuals and audio for the SNES but there was something to it that couldn't keep me interested at all. I just finally sold it off about a month ago, was surprised to get as much as I did which was around 15x what Nintendo is asking on their service which makes it a hell of a good deal. That said I still can play and enjoy Gargoyles Quest II which just popped up on 3DS and WiiU VC too. @tanookisuit ...more than an hour? 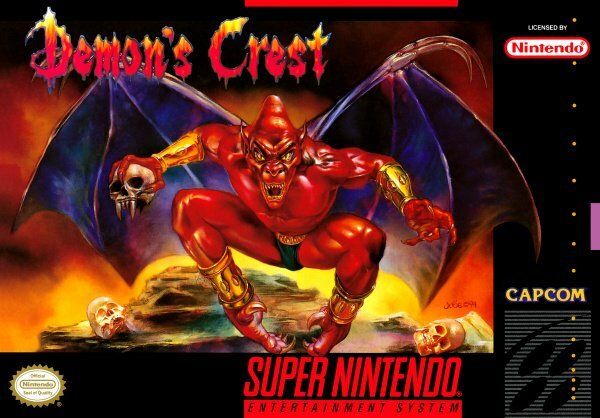 Demon's Crest is one of the new not-RPGs I can play for more than an hour at a time without getting tired...most platformers I especially need to take in chunks because they require an immense amount of focus from me, and once that deteriorates, my performance goes downhill faster than...how can I not make a mom joke here? @CanisWolfred Really? I thought the PSP game would be more similar to Ghosts and Goblins. Not that I've played either. I'll be buying Demon's Crest before long. @SetupDisk Ok, you've single-handedly convinced me to buy this game. @ueI Lemme see...level design seems more like GnG, but a bit more verticle and explorable, with equipment and power-ups hidden throughtout each level, as well as rings and stuff you need to access the final stage. Levels are selectable, too, though your progression is linear. I guess saying its more like Demon's Crest is a bit of a stretch, but it still feels like they merged as much as they could from the spin-offs into Ultimate. @JaxonH I'm really surprised you've not played this game before being the SNES connoisseur that you are.Prepare to be blown away by 16 bit awesomeness. So that means it's easy to find things to not like? In any case, This game irks me the wrong way with the difficulty spikes, and the overall game structure and the music aren't as tight as the previous two had brought me up to expect. I will give it more love, though. So very happy. This game is fairly expensive on ebay. @Pod It's structured Like a Mega Man game. There are no difficulty spikes. You're just fighting the wrong boss. :/ With the right items, every boss is a breeze. After waiting months for Costume Quest 2, I decided to buy and download this first. After 2 hours of enjoyment, I made the mistake of switching to the freshly installed CQ2. What a massive disappointment. I thought the first game could and would have been improved by the sequel and walk away, gravely mistaken. Bayonetta 2 may be the season's most wanted title, but CQ2 is definitely the 'best to avoid'. Lazy all around. Sloppy. Unfunny. Just a sad offering from a company taking a bit too much of it's own press. Enjoy Demon's Crest. Kill yourself to finish it and go back. There are FAR worse options out there. @SahashraLA I wasn't a big fan of the first CQ, but the handful of reviews and impressions I've read of the sequel seem to all say it's "more of the same, if not a little worse". Shame, since I too was hoping the sequel would be improved. Oh well. At least Demon's Crest is good stuff. Got the snes cart for 20 bucks about 6 years ago. Guessing it goes for much more now. If a fan of ghouls n ghosts or just a snes era capcom fan, you will not be disappointed. It is hard though! Anyone know when this is due a PAL release? This game is a masterpiece . On New 3DS VC this Thursday!